Even though the start of the Vietnam War was over 50 years ago, we stop to take the time to remember those who served and lost their lives for our country. But do we ever stop to think of those who were impacted on the other side of the war? 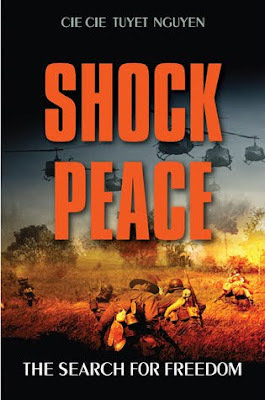 Shock Peace: The Search for Freedom by author and refugee CieCie Tuyet Nguyen explores the war from a different perspective: that of a survivor in the fall of Saigon who unflinchingly recounts the horrors of life after the Vietnam War. A fictional account based on historical facts and the personal experiences of the author, Shock Peace follows young Trinh’s journey as she searches for freedom. A Vietnamese teenager, Trinh has lived through the dark days that led to the fall of Saigon in 1975 and three years under the new regime. The book follows Trinh as she witnesses human rights and freedom stripped brutally away from herself, her family and her countrymen. After struggling with poverty, starvation, desperation, and control, the yearning for freedom propels Trinh and her family to make a daring move - an attempt to escape by boat and face the threat of attack by pirates. At the cost of freedom, 500,000 of her countrymen had perished, most by drowning as they tried to flee. Will Trinh's family be able to find the freedom they seek? The life stories of Saigon's refugees and their tragedies in Vietnam's darkest period, when peace, prosperity and reunification were supposed to emerge from the ashes. How human rights, peace and freedom are the best gifts your country has given you. While unexpected circumstances might change one’s life for the worse, with the resilience to survive, one might be able to get back to where they once were. That cruelty should be exposed not to bring about revenge or to lead to war, but to bring empathy and change. I was in college when Saigon fell and though I was totally against the war, I still remember the images of the Vietnamese people trying to get out of the country before the US troops left. At the end of the war, I was thrilled that it was over and saddened at the number of people who had been killed but I continued to think about all of the people who were left in Saigon and wondered what they were going to face with their new leaders. Shock Peace gave me closure to my feelings about the aftermath of the war. It showed me that even though the war was over for America, it wasn't over for the Vietnamese people. Trough the story of Trinh, I learned about the hardships that survivors went through in Vietnam - the cruelty, the food deprivation and the daily fear that they lived with. But through all of that, there were people who struggled to survive and find freedom and a better life. Even though the characters in this book are fictional, they were based on the author's life and those of her friends and family. I thought that this was a wonderful book to help people better understand the results of this war (and any war)from a different viewpoint. CieCie Tuyet Nguyen was thirteen when she witnessed the actual events. Through the character of Trinh, she relives haunting memories of life under the Communist regime before her dramatic escape. She is now a full-time pharmacist working in the western suburbs of Sydney.